Julia: It's my pleasure to welcome New York Times bestselling author Linda Castillo to Jungle Red! Count me as a big fan of her writing, so when I got wind of the release of her latest Police Chief Kate Burkholder bestseller, Breaking Silence, available, well, practically everywhere, I asked her if she might stop by and answer a few questions. Julia: Welcome to Jungle Red, Linda. Tell us a bit about your writing background. As a New York Times bestselling author, do you find it easier to write in some genres than others? I sold my first novel to Harlequin in 1999. It was a romantic suspense set in New Orleans and for Harlequin and me, the beginning of a terrific relationship. A couple of years later, I sold my first single title to Berkley. Even then, I leaned heavily toward suspense and over the next few years and a number of books, both editors were consistently asking me to back off on the suspense. That’s when I realized I was writing the wrong genre. I had this big thriller trapped inside me, begging to be written. At that point, I had written twenty three books for those two publishers. It wasn’t until 2005, that I conceived the idea for a thriller series set in Ohio’s Amish country, and I unleashed with that big thriller that had been trapped inside me for the last fifteen years. It came in the form of SWORN TO SILENCE. Julia: I admire your strong female lead, Police Chief Kate Burkholder. How did she come about, and what led you to set your terrific series set in Ohio Amish country? Linda:I’m so pleased you admire Kate Burkholder. Coming from an author of your caliber, it’s a huge compliment! When I conceived the idea for my series, I knew I wanted a female protagonist. Don’t get me wrong: I love male series characters. Lucas Davenport, Jonathan Stride, and Jesse Stone to name a few. But the notion of a female protagonist in law enforcement—and in a position of authority—is particularly fascinating for me. To a degree, law enforcement is a male dominated profession. I wanted a female character who, perhaps, felt she had to go above and beyond to prove herself. I also wanted to write a protagonist who could immerse us in the Amish world and give us a first person look at the culture from a unique perspective. Kate has lived in both worlds, and yet she is also an outsider to both. There is one other important element about Kate that is worth mention here and that is her fallibility. She drinks too much. She feels too deeply. She can be impulsive. And she makes mistakes. She can be ambiguous and there are times when, as a cop, Kate walks a fine line. Sometimes she steps over that line. But she is a fundamentally good person. I love putting her into situations where she is forced to make difficult choices. Julia: Whe n is your next release, and what are you working on now? Linda: I’m nearly finished with the fourth book in the series, tentatively titled FALL SILENT. I’m sure the title will change, but it fits the story in so many ways. This story is set in Ohio, but takes Kate out of Painters Mill. It deals with a missing person case that turns out to be so much more. The book will be released in June 2012. Julia: Many people like some mystery with their romance. Others like some romance with their crime. Stepping out of the romance world, how do you balance those genres in your writing? Do you find that male readers are as willing to read about a strong female lead character as female readers are? Linda: Great question. My roots are in romance and the genre taught me much, especially when it comes to writing emotion. I receive quite a bit of fan mail and I read every single piece with great interest. Most of my readers, male and female alike, enjoy the relationship between Kate and Tomasetti. There have been a few who didn’t care for it. I think it’s a personal taste kind of thing, more so than male/female. The key, I think, to writing a believable relationship and balancing it with the mystery and police procedural aspect of a thriller is to do it in a minimalist way. By that I mean: Less is more. Julia: A couple of recent film favorites? Linda: I love movies, but I don’t see nearly as many as I would like. One film that really stood out for me was THE DEPARTED from a few years back. I love the storyline and characters. DiCaprio acted his heart out in that one. I especially loved the intensity of the film. There was so much conflict on so many levels. A character driven cable series I really enjoy is the Jesse Stone series based on the Robert B. Parker books. Another recent cable series I’m digging: THE KILLING. I love the brooding Seattle setting. The heroine is understated and it really works for her. The writing and acting so far are superb. Linda: Aside from the time when the guy got mad because I wouldn’t get up and get him a USA Today…  I love touring. I love interacting with readers and talking about the books. I love meeting booksellers and librarians. I was at the Dallas-Ft. Worth Airport on my way to my first event for SWORN TO SILENCE. I’d just gotten off the Skylink after arriving at the terminal. As I was riding down the escalator, I looked down and saw a dozen or so Amish folks—a family perhaps—sitting in a grouping of chairs at the base of the escalator. The sight was so unexpected that for a couple of seconds I was utterly certain my books had somehow offended the local Amish community and they had come out to protest the release of my book. Needless to say, they didn’t pay the least bit of attention to me. It was one of those “what-a-long-strange-trip-it’s been” moments. Thanks for stopping by Jungle Red Writers, Linda! Readers, you can find much more information on the Kate Burkholder series at Linda's website, and you can hang out with her at her Facebook page. Welcome to Jungle Red, your books sound like the perfect mix of suspense and romance to me. Why is it, do you think, that we are all so fascinated by the Amish? Oh, what an airport story...so amazing and so illustrative of how funny life can be. Linda, thanks so much for joining us. You are definitely another author to add to my list. The books sound wonderful, and I love the airport story. 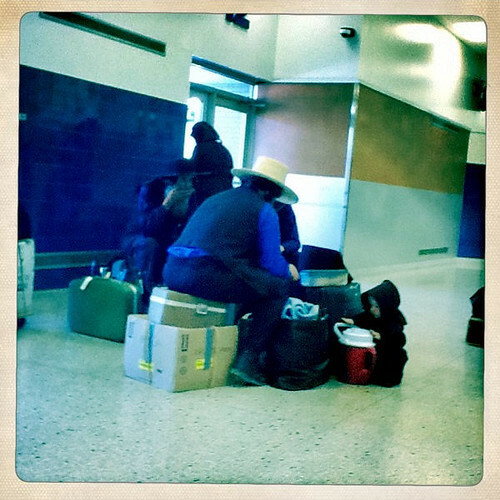 DFW is my home airport, and I must admit I've never seen an Amish delegation, so maybe you did conjure them up . . .
And your covers are fabulous!!! I'm going to start the series from the beginning! Linda, your series sounds intriguing. As a reader, I love LEOs, especially women LEOs. I’m adding another author to my reading list. As a writer, I’m interesting in that balance between thriller and romance. I hve been looking for this kind of book.Really find intresting and insightful.Its been a long time to excel while reading the same calibre of articles and find quite impressive..